I feel the Presence of God in this Blog. The Bible says they that Worship God must Worship Him in spirit and in truth. I return all the Glory to God for Honoring this Bloggers' Conference. In a very special way, I am saying a very Big Thank you to Gloria and Chincobee of a truth they were in the spirit when preparing for this conference and I thank them for working according to the instruction of the Holy Spirit. and with Jesus joy please I present to You our First Lady....the Women's President in the Person of BMF..
before I step down am saying Happy New month...My treasured Leaders and readers, and invitee!!!!! I feel elated to share the word of God with my fellow bloggers and wlcmwisdom blog Readers. I pray that God speak through me to you this day. The theme of our Annual Conference is"Walking into my Divine Inheritance ".I will be sharing a message title Great Grace for walking into your Divine Inheritance . What is Grace? Grace is love wrapped with mercy as given to men by God, grace is God sufficiency or God's fullness in the life of a believer. It should be understood that there is a limit to how far a man can walk in inheritance without the power of grace. Grace in life is more than what can be shared. Nine Gospel Facts about Grace. 1. Grace is what makes a man function without struggle: Do you know if you have God's grace upon your blog, multinationals will look for your blog to advertise on it. That is what I call unmerited grace. Psalm 45 :2 "thou art fairer than the children of men, grace is poured into thy lips, therefore GOD hath blessed thee for ever. .
2. Grace is what people see when God is involved in the race. Do you think it is only Linda that is the hard worker in this part of the Country?what distinguished Linda ikeji blog is the grace of God and not her efforts. 3. When a man is operating under grace, he becomes a spectator of himself, watching how things unfold on his life, just as others watch. Such a person experiences a kind of progress he cannot explain. :sometimes when God bless us, he blows our mind, we become confused like God I didn't ask for this kinda blessing. That is the grace of God at work. 4. Grace is a mark of exemption. It exempts people from trouble. 5. Grace covers one errors and colour ones effort. I was telling someone that throughout my 7years in the university, I did not have any carryover nor extra year nor did I settle any lecture. I am a kinda absent minded student but Grace of GOD saw me through university and law School. Hmmmn! God's grace is ever available at your disposal. 6. Grace turns a dullard to an expert. 7. Grace makes one a beneficiary and a surprise to the world. Queen Esther in the bible was lifted and became a surprise to people as a result of grace. By all ramifications she was not qualified to be a king wife but grace made it so. 1. You must be born again 2Cor 5:17 Therefore if any man be in Christ, he is a new creature :old things are passed away behold all things are new. 4. You must be hungry for the word. As the deer panteth after water so my soul longeth after thee. 5 You must be humble :James 4:6 but he giveth more grace. Wherefore he saith, God resist the proud, but give grace to the humble. Lastly You must stay in his presence 1 king 17:1 Elijah said. ...when you stay in his presence something is rubbed on you and when you come out you are a different person. 8. Be dedicated to your service :What ever you do,be dedicated, many lazy bones love to be celebrated but they lacked the grace that could lift them up because they cannot be recognized for outstanding service. Look through 2 kings 3:11,how Elisha served before he could receive double anointing of his master, he served faithfully for twenty years. Are you dedicated in service to God and the servants of God or even your business, blog whatever, if you do, then be rest assured that you will walk in grace into your inheritance. As we start a new month, the last month in the year, I Pray that the grace to walk into your inheritance will be given freely unto you, this is your season to enjoy your inheritance. Didn't know we had powerful WOG on the blog sphere. Mehnnnn am impressed. 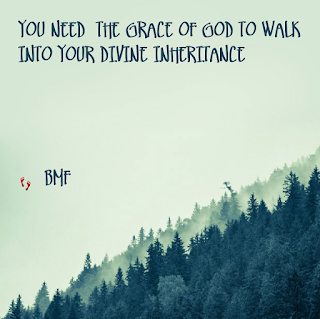 May God engrace you the more Bmf. Seriously Pastor Gloria..when I read this Spirit fill Word...I said to myself the devil is in trouble because we are not only going to "walk into our Divine Inheritance" but will openly disgrace their plans....because once we have the knowledge of the "Benefits of the Cross" and how to "Live a life of Purpose and fulfill God's Purpose".......disgrace is out from our lives for God's Grace to make us to be a voice in our field and not an echo! Thank you Holy Spirit, thank you Son, thank you God the Father for Glorifying your Name in this Blog and in the Lives of our Treasured Leaders and Readers! then just begin to worship the Ancient of Days, the Alpha and Omega, the Beginning and the End! I'm speechless! Never knew my dearest BMF is this gifted in the things of God. More grace sweetie, and I ask for God's divine grace to locate us all in everything we do. Amen: It's only grace that makes us go and succeed where others go and failed. Grace of God at work in our life. 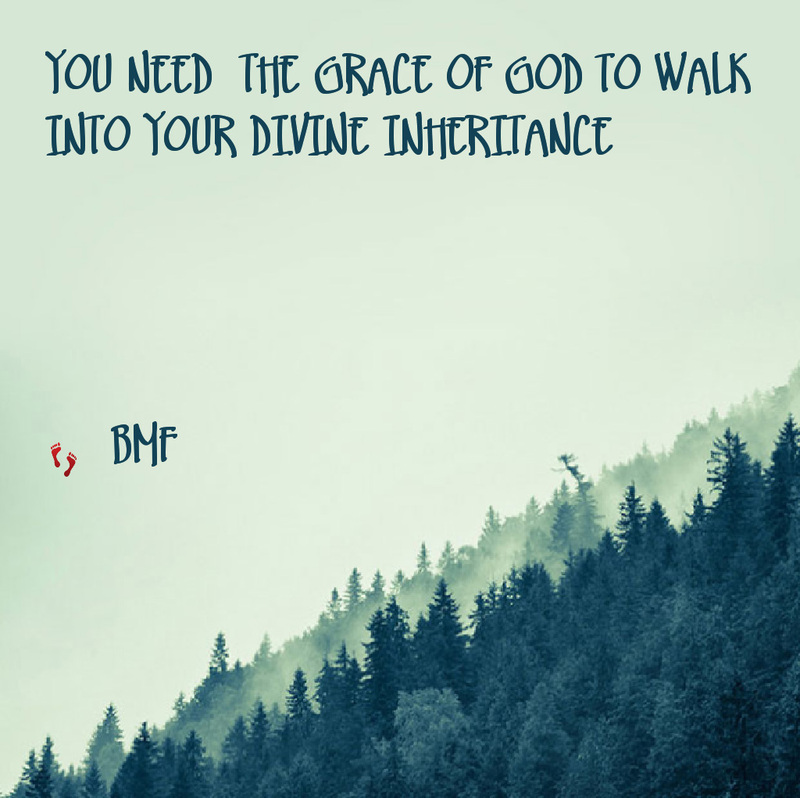 Pastor BMF may God's grace never depart from your life. GRACE... OH God's Grace which rights a wrong...which maketh the impossible possible. The Greatest... His Grace which has brought us thus far will see us through. Amen. glory be to God in the highest,all praises be unto him. Great word. Thank You LORD for the army You are building. I see the kingdom of darkness being torn down again and again. God bless you, Bee. And you too, Lucy. And God bless you too Nwamaka! LOVE IS REAL: CHANGE BRINGS CHANGE!! !